Update: Brunch at Fanatic pictures are here (link). This Sunday, 30th November marks our last Brunch @ Fanatic with Fanatic Kitchen Studio for the year! 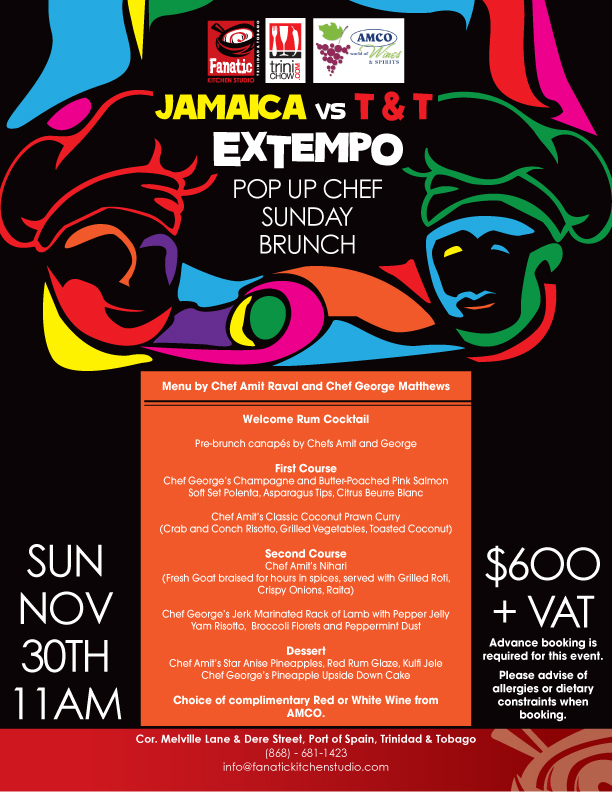 And we’re going big with a “culinary extempo, Jamaica vs. Trinidad featuring Chef George Matthews of Jamaica and Chef Amit Raval of Trinidad. Click HERE for the menu and more details. Also, wine courtesy of AMCO World of Wines & Spirits is served throughout brunch. Call Sita at 782-1963 or email sita@fanatickitchenstudio.com for bookings.